When it comes to how to have dinner on the table, I have a 30-45 minute rule. If I can’t get dinner on the table within that time, then I have spent too much time on dinner. One of my favorite, go-to options is chicken. 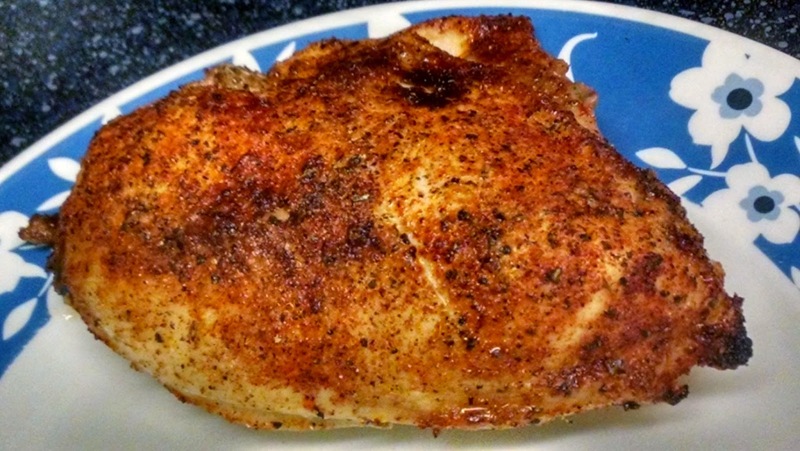 No shake and “rattle” chicken, and no chicken in a tub, but delicious homemade chicken. I prefer using bone-in, skin-on “split” chicken breasts for this application, or chicken thighs work just as well. Truthfully, you can use just about anything, but keep an eye on the cook time as boneless or smaller pieces of chicken will cook differently than the bone-in, skin-on breasts. For crispy split chicken breasts: Set your oven to 400 degrees and make sure the baking rack is placed in the middle of the oven. These chicken breasts will cook in about 28 minutes in the oven and will need about 5-8 minutes to rest once they come out of the oven. 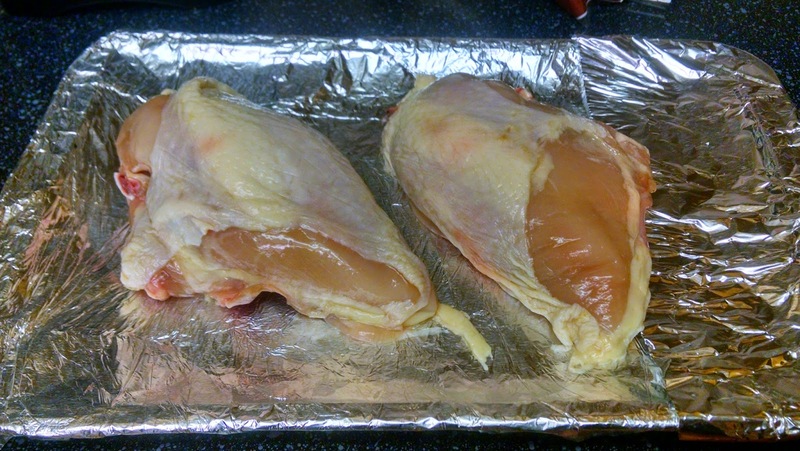 When in doubt, use your thermometer to make sure the breasts have cooked to a final temperature of 165 degrees. 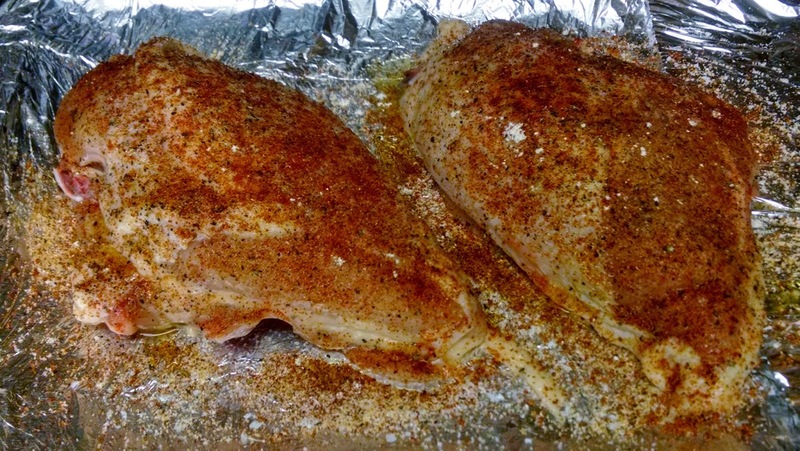 Before putting the chicken in the oven, you’ll want to grease the breasts with a bit of Olive oil before seasoning it with your favorite blend of spices. Any guesses? Chances are good that you can probably guess my recommendations, but let’s review! Seasoning blend: Salt, pepper, paprika, garlic salt, onion powder, and barbecue seasoning. After 28 minutes at 400 degrees you will achieve this! Oh, in order to make sure you deliver with the perfect crispy skin and amazing color at the 28 minute mark, turn your oven to broil at 450 degrees for 2 minutes. You will need to watch this carefully because the chicken will turn dark in a hurry. Once the chicken comes out of the oven, cover with foil while the meat rests so it stays hot and juicy for your dinner. 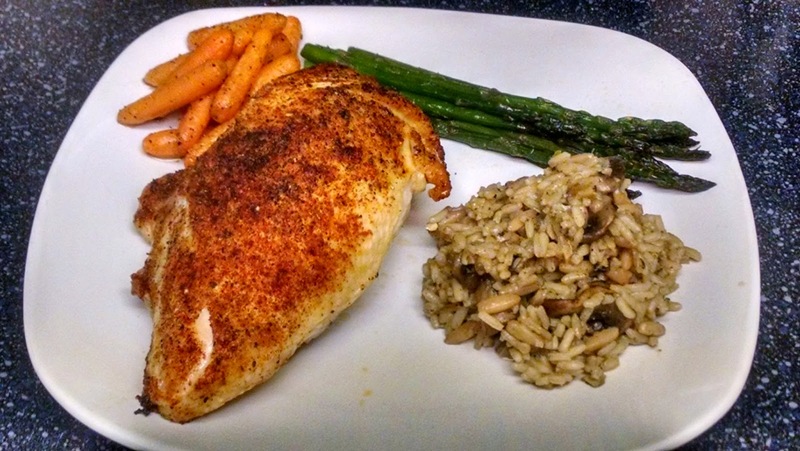 Below you’ll see our final plate with asparagus, carrots and mushroom pilaf, plus a juicy, crispy-skinned chicken breast to delight your senses. This will be a go-to recipe for any occasion, and a must for a casual dinner with friends. If you want your chicken to be crispy, but you don’t want to put it in the oven. What else could you do with it? Well, no surprise here, I say throw it on the grill! The real trick here is to get color on skin, those perfect grill marks and then move it to a cooler part of the grill to let it cook through. I would say probably 3-5 minutes on the skin side, then move off to a lower flame and heat to let it finish.